Downtown Miami is now the home of a new sculpture courtesy of Sprint. Locating this artwork at 1200 Brickell Avenue, you might think that the nation's fourth largest carrier would create something that rallies South Florida around one of its legendary heroes. Perhaps a statue of Hall of Fame QB Dan Marino, or NBA superstar Dwayne Wade, or even Mr. 305 himself, Pitbull. 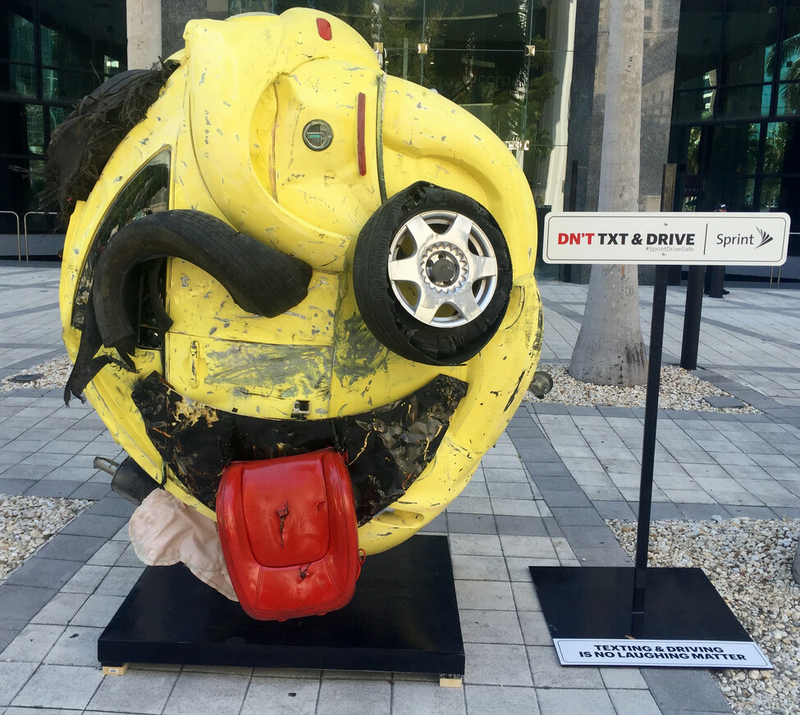 Instead, Sprint created a sculpture called "The Last Emoji," which was made from a crashed car taken from the junk heap. The idea behind the artwork is to scare off drivers who like to text and drive. Sprint is hoping that those in the vicinity of the sculpture take a picture or selfie with it and post the snapshot on social media using the hashtag #SprintDriveSafe. The carrier is doing its part to reduce deaths and injuries due to distracted driving with its free "Drive First" app which will lock a handset automatically when the vehicle the phone is in reaches speeds of 10mph. At the same time, calls go directly to voice mail and notifications for text and email messages are turned off. A pre-written message tells those trying to contact the person that he is on the road. There are two buttons that can quickly override the app. Last year in Florida, 45,000 crashes took place because of distracted driving. 200 of those incidents resulted in fatalities. If they had a fast working network, drivers wouldn't be distracted so much. I know right? If their customers didn't have to keep trying to send the text out maybe they wouldn't have to keep looking at the phone. Or if their internet would go at a decent speed so that maps on the phone would work. Just because you are on your phone in the car does not mean you're texting. Buy a car with GPS. Or get a dashboard mount. Are you really going to make up some lame excuse to hold a phone while driving? SERIOUSLY!!!! Stupid comment of the day! 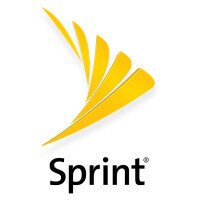 You are forever talking crap about Sprint and you don't even have their service. Their network is very fast, most new phones that support LTE-A carrier aggregation get speeds of 100+Mbps. Please stop talking out of your a*s.
I live in Miami. Trust me, the situation is worse than the numbers reveal. If they counted the near-misses, the middle-finger salutes and the road rage shootings, the stats would be staggering. As for the article, the only sports icon worth mentioning is D-Wade. They don't call it Wade (Dade) County for nothing. Also Giancarlo Stanton, Jaromir Jagr (well, that's sort of a stretch), Jason Taylor, Alonzo Mourning. Looking forward to beating the crap out of LeBron in the East finals. Regards, Alan F.
Many in the country see Miami fans as being fair-weather fans so Taylor and 'Zo are distant memories. That is mostly true but I'm a homer through and through. If Stanton stays for the duration of his mega-contract, he'll end up in the Wade, Marino and Shula stratosphere. Memo to LeBron: You can't win without us. As we used to say during the Heat's dark ages - Can you feel the Heat down in your soul? Really? People see this stuff on the news already. All people think alike. They know it can happen, the odds are in their favor that it won't. Or they feel it won't happen to them because they are immune to statistics. This is why when I purchased my car, I wanted one that would give me a full hands-free experience. I can talk and text via my voice and never take my hands off the road or the wheel. When I watch people text and drive. I be like, how hard is it to get a hands free or stick one headphone in your ear which is also legal. Most of the time its females. We have plenty of them anyways. A lose of a few due to stupidity is welcomed. I wanna laugh more at this sculpture than I am scared of it. That doesn't even look like a real car crash. Not sure if they were aiming toward a smiley face but that's what it looks like to me.